Terracotta or clay pots are the container of choice for most gardeners. Most of us use these pots for container gardening, and we can’t help but bring them in for the winter where they adorn our interiors through the cold season. That said clay pots never seem to be as attractive inside as they do outside. With a little bit of creativity, you can spruce up your clay pots. There are many fun ways to decorate clay pots, and if you have children they’ll love to get involved! I’ve put together a few decorating tips below that are sure to make your pots a little more interesting. Paint: Painting pots is an easy way to add color, and a burst of brilliance to your home & garden. You can use light, rough brush strokes for a rustic look, or use many coats of paint for a smooth, polished finish. For a more colorful pot, paint the rim and the bucket different colors. Paint a series of pots different colors and group them together for the ultimate pop. Patterns: Pain your clay pots in fun, colorful patterns. You can use simple painters tape to create geometric or abstract patterns such as swirls, dots, stripes, or simple shapes. If your super creative, and a little more talented with a paint brush, paint your pots with flowers, the names of what you will grow, names of your children, and even full scenes. Ribbons: If you don’t have a ton of time or creative “juices” add a ribbon to your clay pot. 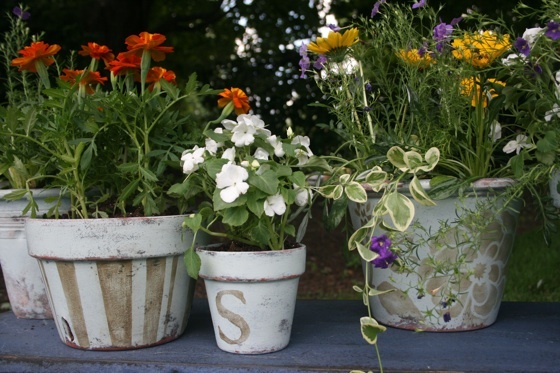 Adding a ribbon can be one of the easiest ways to decorate your pots. Ribbons are readily available, and come in many widths, colors, and patterns. Create contrast between the color of the ribbon and the color of your plant, or match it. Use a different width, color, or patterned ribbon for each member of the family. Any way you look at it ribbons are an easy way to spruce up your pots. 3-D Accents: Adding “real” accents can completely transform your clay pot. Use glue, liquid nails, or a thin mortar to attach accents such as, pebbles, buttons, or tiles. You can create random patterns, or a distinct pattern to add interest to your pots. You can also transform your pot into a living container using moss, and other organic materials, but I think I’ll do a how-to post on this later. Holidays: With Easter right around the corner, why not create an attractive holiday pot? Creating clay pots that are decorated specifically for holidays can add a seasonal touch to all your container plantings. Solid holiday colors, holiday patterns, or fun designs such as a jack-o-lantern for Halloween are fun options that are easy to decorate. My little one and I forced some spring bulbs and decorated the pot with a wicker look for a nice spring Easter basket! Any of these simple decorating ideas are sure to spruce up your terracotta pots. Whether they are inside or outside, your newly decorated pots are sure to impress. Leave a comment, and add some pictures of your masterpieces, we’d love to see them! This entry was posted in Birds, Gardening Tips, Homeowner, Indoor Gardening, Landscaping, Uncategorized and tagged Adhesive, Brush, Easter, Garden, garden care, Garden hose, gardening hose, Halloween, kink free garden hose, landscaping equipment, lightweight hose, Paint, Pottery, Shopping, TUFF GUARD The Perfect Garden Hose, Twitter, unkinkable garden hose, water hose. Bookmark the permalink.